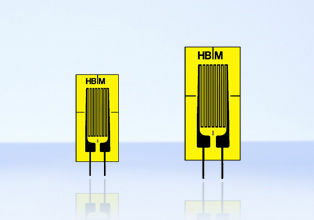 The LD20 series from HBM are strain gauges for high strains, or compression greater than 5%. The resistance must be considered in selecting strain gauges, depending on the constraints of the measurement task. Strain gauges of 120 ohms are relatively resistant to fluctuations in the insulation resistance. It is an advantage for higher-impedance strain gauges to produce less heat, due to the lower measuring current. In addition, they are less sensitive to resistance of connecting cables against the measuring amplifier. There is also a disadvantage that high-impedance strain gauges may be more sensitive if noise pulses are received. The LD20 also exhibits a lower resistance to alternating loads. This provides detailed representation with its maximum elongation range of +/- 100,000 µm/m (+/-10 %).